A few days ago, NPR lead into its coverage of the State of the Union Address by putting up a retrospective on President Obama’s visit six years ago to my high school in Elkhart, IN. It was January, 2009, and Obama chose Elkhart as the first destination of his term in office because the town served as the begrudging poster-boy of the Great Recession. 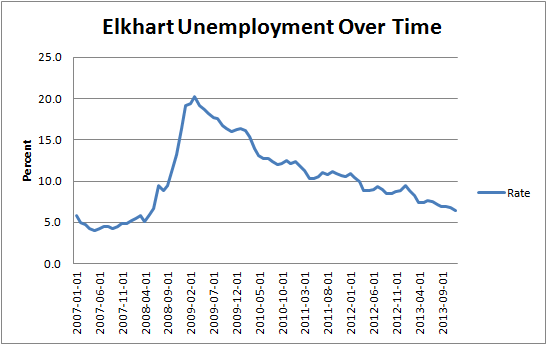 When Obama visited, the unemployment rate in Elkhart was 19.1% and it would go as high as 20.2% a few months later. The title of “Recreational Vehicle Capital of the World” did not do the town much good in an economic climate in which RVs were completely undesirable. Six years later, as NPR chronicles, the economy of Elkhart has rebounded substantially, but is it any less susceptible to economic shocks than it was in 2007? If you read the NPR article, you might think that, apart from some issues with part-time employment, things in Elkhart are pretty rosy, and you might be right. The town has recovered rather quickly: main street is more lively than it’s been in years and the unemployment rate is below the national average. But the top-rated comment on the article reveals that Americans aren’t buying this article, and I don’t think Elkhart should either. Says Richard Freeze, “I find it disturbing that Elkhart Co. considers the RV industry as hopeful. In fact, it seems to be exactly the sort of industry that depends far too much on fickle economics,” and then James Jay in response, “You are right. There is nothing in this article that suggests that Elkhart is being prudent by trying to diversify their economy.” So, that is the question: is Elkhart simply hitching itself to the waves of the RV market, or has it learned from its mistakes and insulated itself from future shocks? Data from St. Louis Fed and the Bureau of Economic Analysis. Calculations and graph are my own. So what can we draw from this? 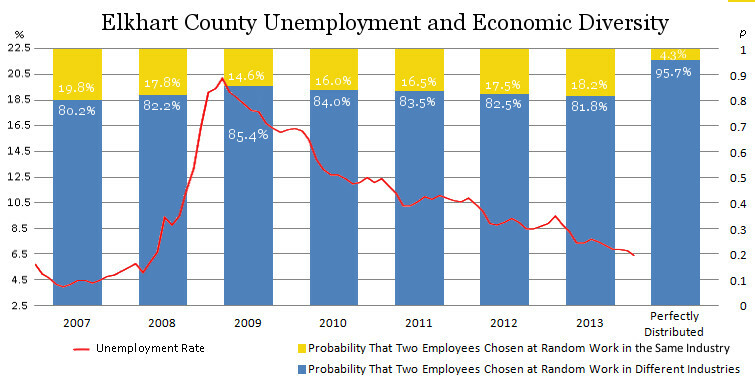 First, the level of diversity among the county’s economic sectors actually rises at the height of the recession. Second, while it hasn’t decreased to the level it was at in 2007 yet, it seems to be trending back in that direction. While maybe not a good sign for the Elkhart economy, it actually makes a lot of sense. The sector which took the biggest hit during the recession, manufacturing, also represented the largest portion of the county’s employment (it fell from 41% in 2007 to only 33% in 2013). Thus, while other sectors lost employment too, their lessened impacts served to make the economy appear more diverse. Note: if there’s any idea I don’t want you to take out of this blog post, it would be that loss of jobs in manufacturing in 2008 and 2009 was a good thing because it diversified Elkhart’s economy. It clearly negatively impacted many people, including my own father. However, as Elkhart’s leaders look to the future, they might be well-served to direct their efforts toward cultivating new economic development into areas which might be less susceptible to economic tides. Data from the Bureau of Economic Analysis, Calculations My Own. It seems that, by this measure, Elkhart is the least economically diverse of all four counties, and it’s getting less diverse at a faster rate than any of them. Durable Goods as Percentage of Metropolitan GDP. Data from the Bureau of Economic Analysis, Calculation Mine. These cities are pacing the nation in durable goods manufacturing and are currently recovering well because of it. 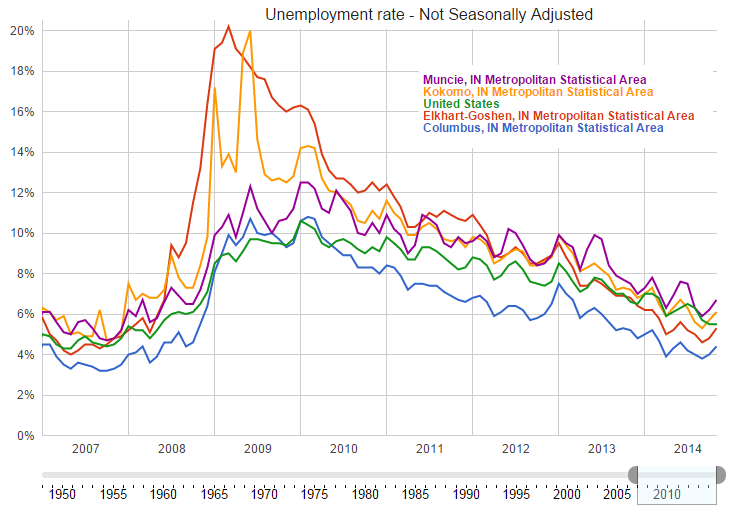 Muncie, the most diversified of all four, has neither experienced as severe of a spike in unemployment nor recovered quite as ably. 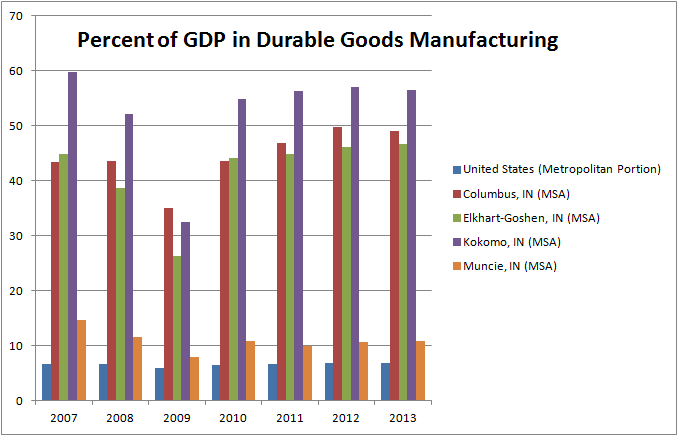 The other three cities may be able to gloat about their success right now, but their ever-increasing dependence on durable goods manufacturing means they will be just as susceptible the next time we face economic shocks (if you don’t believe me, check out this chart. Kokomo’s unemployment rate history is a roller coaster). Fortunately, Elkhart’s leaders seem to be aware of their predicament. The Elkhart Truth has recently posted two fantastic articles highlighting the need for economic diversification. The first is essentially a series of charts that are very revealing about the dominance of the RV industry. The second takes a more in-depth look at what the county’s leaders are planning to do about it. They clearly recognize that diversity is an issue, but talk is cheap, and so far the data demonstrate the recognition without action is useless. Furthermore, they seem to be stuck on the tired economic development models of tax breaks and business attraction that I was dismissive of in my post last week (although they do recognize the importance of an educated workforce). I encourage you to take a look at that second article, paying particular attention to the words of Ball State economics Mike Hicks. Says Hicks, “Perhaps 90 percent of [new jobs] develop organically in a community based on specific local needs, not because of recruiting efforts,” and, “Developing the amenities a community has to offer, things like schools, parks and cultural offerings… will lure people, which will in turn lure business.” Sound familiar? Economic development is about people, not taxes. 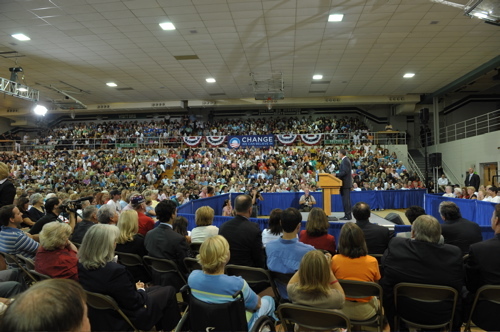 I stood in that gym as our nation’s President invited a laid-off RV worker to introduce himself to the nation. My hometown was, for once, in the news, but it was in the news for all of the wrong reasons. Six years later, the city is just as susceptible to economic shocks as it was in 2007. Elkhart’s leaders seem to be aware of this, but I’m afraid that awareness without strategic adjustments will not be enough. Please, Elkhart, let’s flip the script. Let’s make the next Presidential visit be about celebrating our success. Like what I had to say? Have a question? Leave a comment below.